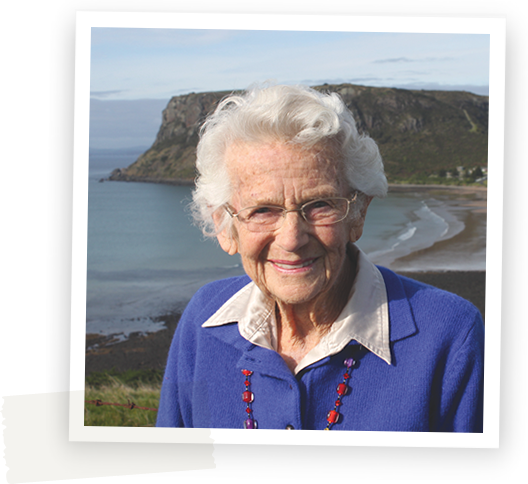 Marguerite ‘Meg’ Eldridge OAM (2 April 1921 – 26 February 2013) was one of Stanley’s most respected and admired residents. It is unlikely that the historic town of Stanley would have survived as the ‘jewel’ that it is today without Meg’s lifetime of unstinting enthusiasm, devotion and dedication. Meg, the first daughter of Cliff and Margaret Leatherbarrow, spent all her life in Stanley. Although she had little opportunity for higher education, she was very self motivated and developed her natural talents with minimal tuition. Her mother was an accomplished artist and encouraged Meg to develop this skill, little knowing that in 1976 her daughter would enthuse a committee of local people to establish the Circular Head Arts Festival. This was a very successful annual event for about 15 years and attracted countless visitors from around Tasmania and interstate. It contributed substantially to the evolution of Stanley as a major tourist destination. During this time Meg represented the state at the first World Festival Forum in Brisbane. Both her parents were very community minded people and Meg followed in their footsteps. Among Meg’s achievements were the establishment of the Stanley Discovery Museum & Genealogy Centre in 1973, and later Joe Lyons Cottage in 1988. She enlisted willing helpers to make these projects possible and, to her credit, they remain as popular tourist attractions for Stanley. She led by example as office bearer and hostess of both attractions for several decades. Everything Meg did to passionately and proactively promote Stanley was always done in a volunteering capacity. She never sought personal gain or accolades, but was ever ready to put herself forward if it would benefit the town. She was always a gracious and unassuming lady. Recognition of her contributions to Stanley include the Australia Day Citizen Award in 1982, the Tasmania Day Award in 1996 and a Medal of the Order of Australia in 2011 for her services to the community of Stanley, and to the arts. She was an inaugural inductee into the Circular Head Hall of Fame in 2012. The historic town of Stanley has benefitted from Meg’s lifetime of unstinting enthusiasm, devotion and dedication to preserving our unique history.